HMH Books for Young Readers, 9780547238661, 32pp. When the Lusitania was attacked in 1915, the American composer and New Yorker Charles Ives transformed the experience of this heartbreaking news into a musical piece. 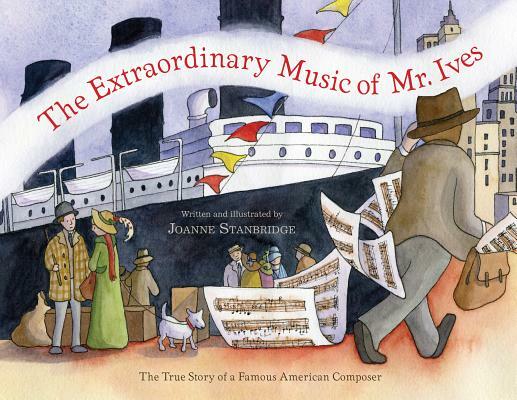 It begins with a jumble of traffic noises, then the hurdy-gurdy swells into the lovely old hymn “In the Sweet Bye-and-Bye.” In lyrical text and watercolors—sometimes in dramatic wordless spreads—this thoughtful picture book reveals not only a wartime tragedy, but a composer’s conviction that everyday music can convey profound emotion—and help heal a city. Young readers will understand that if they listen, music can be heard in the unlikeliest of places, from the busy chatter of a market to the wail of a fire engine. Joanne Stanbridge lives in Ontario. She has written and illustrated several books for young readers in Canada, working with Scholastic Canada, Annick Press, and Red Deer Press. This is her first book for Houghton Mifflin and her first book in the states. "Unthreatening despite its subject matter, yet impressively moving." "Stanbridge writes well for young children, with a straightforward bu absorbing text." "Stanbridge's work is its own curious, yet quietly inspired composition, a meditative ode to an artist."